For many servicemen, the battle is over, but the ink lives on. Thousands of soldiers have chosen to commemorate their military service through tattoos, a custom as old as war paint itself. Yet military tattoos go far beyond the usual anchor and eagle clichs, and are often as complex and varied as the military experience. For the first time, documentary photographer Kyle Cassidy has sought out veterans who marked their military service with a tattoo and they are shown here in all their glory: fresh, faded, sometimes intertwined with wounds, physical and otherwise. And the stories behind these tattoos, both conventional and surprising, are just as engaging. In a transient world, with shifting enemies, mores, leaders, and friends, this is a testament to the values of a permanent commemoration. The unique journey into each soldiers story will captivate you. Not only is this book a great resource for history and military buffs, but it is also a great reference for tattoo artists. I have a huge amount of respect for the armed forces, these men and women risk their lives for their countries and to uphold our way of life and I'm incredibly grateful to them for everything they do. 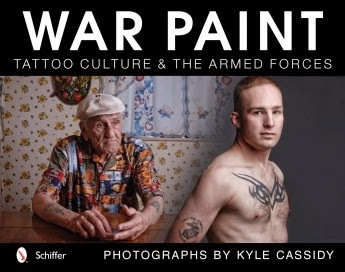 I'm also fascinated with the tattoos people choose and the reasons behind them so of course I wanted to read War Paint the moment I first heard about it. Kyle Cassidy has spent years talking to veterans and serving members of the military both young and old, talking to them about their tattoos and the stories behind them. As much as I enjoyed looking at the photographs of the tattoos themselves it was the stories that really captured my attention. This book contains a collection of stories from people who have served in the army, navy and air force anywhere from Korea and Vietnam to Iraq and Afghanistan. Some of these stories are amusing, more are poignant but all are heartfelt and they make for fascinating reading. This is the kind of book that you can dip in and out of easily, one that you'll pick up and spend half an hour reading today but happily come back tomorrow to read a bit more. If you have any interest in military history or just a curiosity about tattoos in general then I'm sure you'll enjoy this book.